It was the practice for messengers from the Court to travel about through cities and villages, all over the empire, and report personally to the Ruler the information they had gathered during their secret wanderings. Rama listened to these communications, as his predecessors used to do. One day, a messenger who had come on this duty approached Rama with a hesitation that was strange; he prostrated before him, and rising up, stood mute and trembling on one side. Soon, he recovered confidence and courage and addressed Rama thus: "Maharaja! Listen to my words! Pardon me for bringing these words to you. A washerman was quarrelling with his wife. He was heard admonishing her. 'Fie on you!, he shouted. Do you take me to be Rama? Get out of my house. How can I accept you? You were living long in another person's house; get out of here!' ". These words struck the heart of Rama like an arrow. He could not sleep that night. Towards midnight, he sat up on his bed and thought within himself. "It is now one full Yuga since I started ruling this land. I have to continue for a few years more." Then, sunk in a sad reverie, that Ocean of Compassion thought, "Alas! I have to forsake Sita. I have to uphold the Vedic Path." He went near Sita and spoke to her pleasantly. He had a smile on his face when he told her, "Janaki! You have not asked any boon from me so far, yet, I shall grant you a boon. Go to your holy Home." That very moment, Sita fell at the Feet of Rama and went to Vaikunta (Heaven) in her subtle body. No being anywhere, nothing was aware of this fact. Sita in her gross physical frame only was standing before Rama on Earth. Rama asked the Earth-Sita (Maya Sita) "Pray for a boon" and Sita replied, "Lord! I have a desire to spend some happy days in the hermitages of Muni's (ascetics)". Rama said, "Be it so" and told her, "Start on your journey tomorrow morning". She collected and packed many articles of clothing and utensils for the daughters and wives of ascetics of the hermitages. Rama woke up early. Servitors and favor-seekers were singing praises of His virtues and excellences. 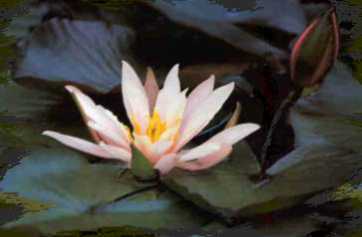 His lotus-like face bloomed. Lakshmana, Bharatha and Satrughna paid homage to Him prostrating at his feet. But, Rama did not converse with his brothers. He kept silent. His face was flushed with emotion. His body showed signs of tension. Every limb was shivering with excitement. The three brothers were lost in fear and anxiety, not knowing the reason for his grief. They shuddered at the sight of Rama's sadness. They could not fathom the feelings that agitated him. At last, Rama found words to express his wish. Between sighs, he said, "Brothers! Don't say, no. Take Sita into the forest, leave her there and return." On hearing this, they were stunned. They were caught in the flames of despair. Their hearts were scorched. They doubted whether Rama was serious or was only joking. Satrughna sobbed aloud; Lakshmana and Bharatha stood motionless, tears streaming from their eyes. They were speechless. Their lips were quivering; their hands were shivering. At last, with folded hands, Satrughna prayed thus: "Your words have pierced our hearts. Janaki is Lokamatha, the Mother of all beings. You live in the hearts of all living beings. You are the Embodiment of Sath-Chit-Ananda. For what reason has Sita to be discarded now? She is eternally pure, in thought, word and deed, isn't she? O, Destroyer of the Rakshasa Race! She is now pregnant and, at this time, in this condition, is it right to forsake her alone?" Satrughna could not say more; the sorrow surging within him flowed in tears and loud wails. Rama said, "Brothers! Listen! If you disregard my word, breath cannot survive in this body. May it be well with you. Brothers! As I have ordered, take Janaki into the forest this very morning." He continued sitting with his head bent, silent, as if he was sad at the turn of events. Bharatha could not restrain his feelings, when he heard the words, so shocking to the ear. He said, "Lord! I am very low in intelligence. Yet, please give heed to my prayer. Our Solar Dynasty has earned fame and renown in the world. Our father Dasaratha, your mother Kausalya and you yourself - Master of the Three Worlds - have won great fame. Your glory is sung by the Vedas and by the thousand-tongued Sesha. Janaki is the repository of all that is beneficent. Her name will destroy all traces of inauspiciousness; it will confer all things beneficent. She is the soul of holiness. By her blessings, women can attain the supreme Goal. How can this Janaki live separate from you and exist happily in the forest? Can she live even for a moment apart from you? How can a fish live without water? She is the embodiment of wisdom and the personification of all the virtues. She cannot lead a solitary life." Rama listened to his words calmly and then replied thus: "O Bharatha! You have given utterance to words that are consonant with ordinary ideas of morality. But, the Ruler has to foster Dharma and welfare according to the dictates of morality. In carrying out his duty of guarding and guiding his people, he should not cause any crisis or revolution; he has to protect them with great affection." Then, he disclosed the information that the messenger had gathered and communicated to him. He said: "Brothers! Our dynasty has suffered great infamy. Its name has been tarnished. This dynasty had a series of Kings and Emperors each one more famous than the others. Their might and majesty are known all over the world, There is none who won greater renown than they. They were ready to give up their lives, but, they never acted contrary to their plighted word. Our dynasty has no taint attached to it. And, when there was a likelihood of its being tainted, he who hesitated to give up his life was certainly vile. Understand this well." At this, the brother cried, "Lord! Janaki surely has no trace of taint. She has come out of the blazing fire. Gods or saints will not impute even in dreams the slightest fault in her. Not knowing this, if anyone calls her a sinner, he will suffer the torture of hell for billions and billions of years." Bharatha could not control his resentment at the very mention of this possibility. At this, Rama became visibly angry and his eyes reddened. Lakshmana noticed it, and unable to withstand it, he hid himself behind Bharatha. But, Rama addressed Lakshmana himself directly. "Lakshmana! ", he began, "Grasp the implications of what the people are saying; give up the foolish pose of sadness. If you disobey my command and begin arguing with me, you will have to rue it until death. Take Janaki in a chariot and leave her to herself in a deserted place with no human habitation on the bank of the Ganga and then return." Lakshmana heard the command of the Lord; he prepared himself even for death, if it encounters him, while carrying out that command. He got ready for the journey. Stocking the chariot with provisions and clothing, he made Janaki sit in it and then, drove off. Rama's faithful consort was elated at the prospect of spending some time in hermitages; she was full of delight and gratitude. But, seeing the crestfallen face of Lakshmana, she was saddened. She became mute and dispirited. Like the cobra that had lost its crest-gem, she suffered unseen, in her depths. They reached the bank of the Ganga. The forest was frightful indeed; they got terror in their hearts. Seeing Lakshmana fear, Sita was frightened more. Of course, she knew that she was only acting the part and that her real Self was not there. Still, to make her role successful before the world, she acted her part well. She wailed, "O Lakshmana, where have you brought me? There is no hermitage visible here. Do no wild beasts and poisonous snakes roam about in this forest? No sign of human habitation can be seen here, Lakshmana! I am getting afraid." When Sita lamented thus, Lakshmana was overcome with sympathy. He remembered Rama and said within himself, "Rama! What is this you have done!" and, gathering some courage, he looked at Sita, but a fatal thirst overcame him at that time and he suffered much. Sita was torn with anxiety at his condition and his struggles. Realizing that he was determined to leave Sita there and return, the deities of the forest spoke from the sky, "Lakshmana! Leave Janaki here and go back; Sita, the Embodiment of Fortune, shall live". These words from the Unseen planted courage in the heart of Lakshmana. He folded his palms in reverence and said. "Mother! What can I do? I cannot but carry out brother's command. I have no courage to overstep it even to the slightest. I am the vilest villain. Brother has ordered me to leave you in this thick jungle and return." Saying so, he turned the chariot back. His looks were fixed on the track he was leaving behind. He could hear the lament of Sita in the distance. "Lakshmana! Are you abandoning me in the forest and leaving me alone? Who will protect me here?" She was wailing like any common woman. Her cries pierced the ears of Lakshmana; but, remembering his duty to follow the commands of Rama, he made his heart as hard as rock and drove fast until he reached the City. Meanwhile, Sita fainted in despair. Of course, it was all play-acting. She recovered consciousness after a little while, sat up and poured out her grief in words. "O Ramachandra! From birth, my life has been filled with sorrow. Alas! Life clings to my body, however much I am invaded by grief." She cried out like this for a long time, bewailing her fate. That moment, the sage Valmiki [see also RRV-Ch. 15] was passing through the forest on his way to his hermitage from the Ganga where he had gone for his ritual bath. Her words fell on his ears; he was surprised that a woman's voice was calling out for help from the recesses of the forest; he followed the voice to its source, searching all round, and at last, came to her very presence. She recognized him as the sage Valmiki and related to him all that had happened to her. "0 Monarch of Monks", she appealed, "I am the daughter of Emperor Janaka; I am the wife of Sri Ramachandra; the whole world knows this; but, I do not know why He has deserted me and cast me away. Can the dictates of destiny be escaped from? Great among Sages! Lakshmana brought me here and left. He did not tell me why he had to do so." Lakshmana reached the City, with his eyes swollen with sorrow, and heart heavy with grief. He related the sad tale to the three mothers. They broke into inconsolable sorrow and sobbed at the calamity that had overtaken Sita. They praised the virtues of Sita and lamented that a lady of such sterling character should be subjected to this disaster. They blamed Rama for harshness. The capital and the palace were sunk in sorrow; there was no one free from grief. Wailing was the only sound that could be heard. There was no one who did not ask in sorrow, "could such a mother be ever punished thus?" Rama heard the wailing and weeping. He retreated into the shrine with Lakshmana as his sole companion and spent the day away from the sight of others. Later, he went to the women's apartments, and consoling the Queens, he counseled them along the path of Jnana. He also explained to the people that the true Ruler considers his people alone as his kith and kin, and treats them alone as his friends. This, he said, is the code of Rama, He said that the Ruler should give up his own kith and kin when need arises, since his real kith and kin are the subjects over which he is placed. The three mothers were so affected by separation from Sita that they became weaker and weaker with every passing day. It resulted in their death too, finally. They manifested through Yoga the fire latent in them and allowed the fire to reduce their bodies into ashes. Thus they attained the Highest State of Bliss. The brothers grieved over the loss and performed the funeral rites as laid down in the scriptures; they gave away the sixteen great charities as prescribed therein. Thereafter, the four brothers - Rama, Lakshmana, Bharatha and Satrughna engaged themselves in the administrative problems and assignments set apart for them, in conformity with the wishes of the people and to their full satisfaction. Meanwhile, Rama announced that he desired to celebrate the Aswamedha Yaga, (the Horse-Sacrifice) mentioned in the Vedas since the Yaga would ensure the destruction of all varieties of grief. He sent information to Angada and others. He proceeded to the residence of the Royal Preceptor accompanied by his brothers and the ministers of the realm. They fell at the feet of the Guru and the Guru also received them with respect. He inquired about their health and the welfare of the empire, in sweet soft words. He gave them valuable counsel, quoting stories from Puranas and incidents from the epics. Then, Rama addressed him thus: "Master! I have one wish in my mind. You have to help me realize it". Then, he fell at the feet of the Guru. Vasishta, the Guru, asked him what that wish was, and Rama replied, "I have decided on a Yaga; the people of Ayodhya will be happy, filled with joy when it takes place. What I desire to perform is the Aswamedha Yaga. The City can be rendered calm if it is done. The people also are wanting that it should be performed. Bharatha hesitated to inform you of this, since he is afraid of your reaction. So, I felt I must approach you when you can meet us and we can communicate this wish to you. We shall abide by your decision and gladly act accordingly." Vasishta listened to these words uttered with reverence and humility; he rejoiced at the idea. "Rama! Your wish shall be fulfilled. Bharatha! Rise and busy yourself with the preparations for the Yaga", he said. This made the brothers and the minister very happy. They extolled the Preceptor and fell at his feet. Many Brahmins well versed in the lore about Yagas followed Bharatha into the City and Palace. Sumanthra invited leading citizens and called the officials and asked them to decorate the royal roads inside the City as well as the bazaars and shopping centers. He wanted them to erect Mantaps in many places. No sooner said than done; they executed the orders very soon and the City was made ready for the big event. The City was excited and enthused into joyful activity. The elders of the City and officers reported to Rama that, as he had directed, information had been sent to the chiefs among sages and ascetics, and Vasishta had also been intimated of what was being done. Vasishta advised Rama thus: "Send the news of the Yaga to Emperor Janaka; he will be able to attend the Yaga with his queen and kinsmen". His advice was couched in persuasive and pleasant words. He also said, "Send invitations to the chief ascetics, Brahmins and Maharshis". When the Guru agreed, Rama took him round Ayodhya, so that he might see the preparations; they were both very pleased at the decorations all over the City. The official messengers, visited kingdoms far and near and presented the invitations to the rulers of those lands. One of them proceeded to Mithila, the Capital City of Janaka. Jambavantha, Angada, Sugriva, Nala, Nela and other Vanara leaders arrived. Ascetics and monks came to the City in groups. They were all welcomed and accommodated, with due regard to their spiritual eminence. Soon, Viswamitra arrived; Rama honored him, and offered reverential hospitality. Agastya, [see: RRV2, Ch. 1] the great sage, also reached Ayodhya. He was given proper reception and arrangements were made for his comfortable stay in the Capital. They saw the sanctified Hall where the Yaga was to be held and were delighted. When the citizens of Mithila saw the emissary from Ayodhya, they were very happy. He (the emissary) informed Janaka, the Emperor, of the Yaga that was to be performed by Rama. As soon as he heard the news, Janaka rose from his throne. He was thrilled when he listened to the emissary. His eyes streamed tears of bliss. He enquired whether Rama was well and whether his brothers too were well. He replied that the letter he had brought would satisfy him on all scores and handed over the auspicious message. He could not speak more. And, who can describe the condition of the Emperor? His kinsmen were transported with delight. The City resounded to the shouts of 'Jai'. The Emperor read the Message over and over; he was overwhelmed with joy. He called a courier in and ordered him, "Spread this news in cities, towns and villages throughout the empire. Announce it with the play of the ten musical instruments". Then, he called in the Minister and handed him the Message. He received it most respectfully and pressed it on his eyes, before reading it for himself and being thrilled thereby. Bringing to mind the glory of Rama, he shed profuse tears of joy. In front of every home in the city, the master of the house installed a pot of auspicious significance. The Emperor gave away countless valuables in charity to celebrate his receiving the good news. The City of Janaka was swaying in ecstasy. Janaka arrived at Ayodhya, after the long journey from Mithila. On the way, he alighted to pay his respects to Sathananda, his Preceptor. He blessed Janaka and directed him to proceed fast to Ayodhya, accompanied by his entourage and army - the latter including all the four fighting forces, chariotry, elephantry, infantry and cavalry. Janaka left behind a section of the army to safeguard the City. He assigned a palanquin for his Guru, Sathananda, and himself rode in another. When the entire party left for Ayodhya, the earth quaked. Who can count the number of generals, commanders and heroes that the army had in its ranks? Journeying thus, Janaka reached Ayodhya at the end of two days. When he knew that Janaka was approaching the City and had come very near, Rama went forward to receive him and they met in great mutual affection. A magnificent residence surrounded by a vast plain had been set apart for him. It was a charming heavenly residence, right on the bank of the Sarayu river. Rama had deputed his brothers to receive and render hospitality to the Royal guests. 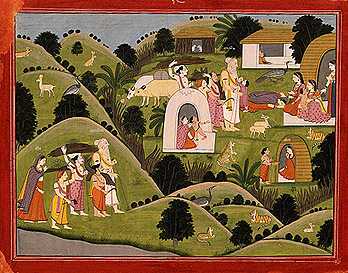 (*) [In the extreme lower left of the painting, Sita enters the hilly landscape following an entourage led by the sage Valmiki. As Sita arrives at the hermitage, her slightly protruding belly reminds us of the condition in which she left Ayodhya. Her subsequent life at the hermitage is presented in several scenes that are distributed throughout the composition and are separated by the rounded contours of reed huts. Sita is seen on three more occasions. At the upper right corner she touches the feet of Valmiki's wife and asks for sanctuary; immediately below she sits in a hut as an acolyte brings her food; and finally, well after the birth of her twins, she is seen playing with one child as the other jumps into the arms of the silver-haired Valmiki].